I call them “basin bluefish”, a wintertime occurrence around the Tampa Bay region. They fight hard: They provide excellent action. 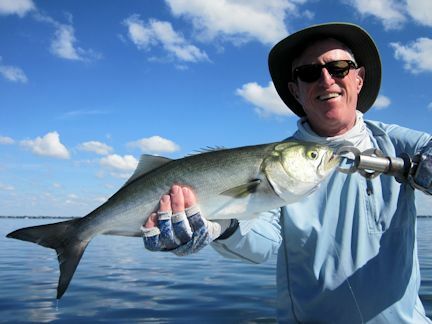 Five to seven pound bluefish take up residence in specific areas. If you find these spots, you should remember them because there are likely to be bluefish in there in subsequent years. A bluefish fights as hard as any fish we have. At this size, they provide some incredible light-tackle fun. Bluefish are tough because “they’re here today, gone tomorrow.” But expect them to be around for three more full months. Bluefish are a predator. They are a predator of impressive status. Rows of extremely sharp teeth, I am most impressed with their jaw strength. I have predicted that one day the story will be that a bluefish has cut an angler’s finger off. Keep your fingers clear of their mouths is the theme I am going for. On that theme, you need to use the right leader line. I prefer 30-pound fluorocarbon. Finding bluefish is easy. If there is bait around, they are going to be crashing it. Otherwise, bluefish are feeding on whatever they can find, like speckled trout: Check the troughs. Most of my bluefish areas are sandy bottom “troughs” which I would say is sand bottom areas that are deeper than the surrounding area. These troughs are normally 4 to 7 feet deep and are bordered by seagrass beds. Throw shiny lures, like gold soft plastics and swim them at a brisk pace. Bluefish should set the hook on their own with hard strikes. Not the best of meat for dining, I keep them, leave them on the smoker for an extra hour and make fish spread out of them.